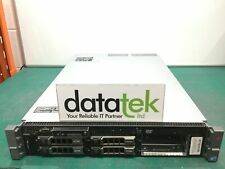 This is a used but fully working PowerEdge T310 server. It has 2x 1TB SATA Hard drives in RAID 1 format using the Dell RAID Perc 6i raid card, has 8GB RAM and the Xeon X3430 CPU clocked at 2.4GHz. It has Windows 2012 R2 Evaluation installed to demonstrate its working condition. 2 x 146GB 10K SAS Hot Swap HDD. For sale is this high spec Dell Poweredge R710 Server. When IT managers learn one system, they have learned the logic required to manage Dell’s next generation servers. Dual X5660 Hex/Six Core Xeon 2.80 GHz CPU's. Dell Poweredge T610 Tower Server. 192GB RAM (12x16GB). 8 x Empty Hot Swap Drive Bays. B Grade Case - it will have scratches and possibly very minor dents as per the photos. 1x Xeon E5640 4C8T (2.66GHz - 2.93GHz turbo). Here we have a Dell PowerEdge T610 - good clean working condition, no errors or issues. Specs are as follows 3x 300GB 15k SAS drives installed - all reporting healthy. Storage: NONE. Graphics: ON BOARD. 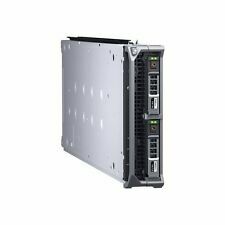 DELL PowerEdge R410 48346960 Server. Condition is Used. Dispatched with eBay delivery – Shutl 2-3 days. WHAT'SNOT INCLUDED: - Optical drive bezel / Hard drives and caddies / Inner Rails / Outer Rails / Cables / Accessories / Software etc. - The machine may bear signs of use and has dust inside. TESTING: - Powers up to BIOS fine without any errors or passwords. Dell PowerVault NX3100 Xeon E5620 CPU. 12GB DDR3 RAM. five 1TB SAS HDs. Dell PowerEdge R310 L3426 1.86GHZ PROCESSOR. SERVER RACK. TESTED IN GOOD WORKING ORDER. UNIT AND POWER LEAD. Dual X5660 Hex/Six Core Xeon 2.80 GHz CPU's. Dell Poweredge T610 Tower Server. 8 x Empty Hot Swap Drive Bays. B Grade Case - it will have scratches and possibly very minor dents as per the photos. Fully Tested.